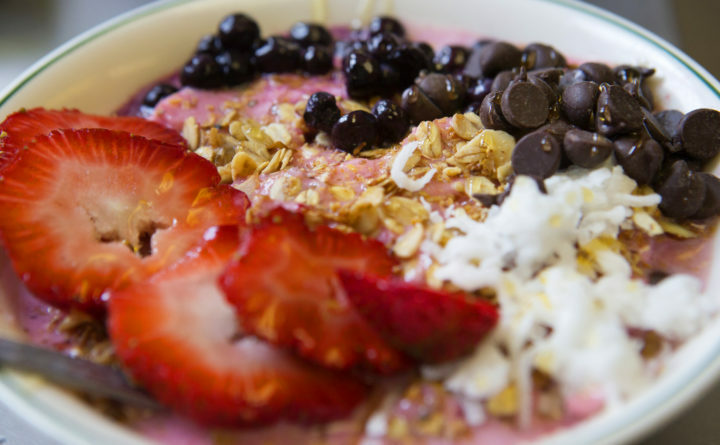 A smoothie bowl is seen at Logical Sip in Brewer. Why we love it: My family recently attended our first $2 Taco Tuesday at Nocturnem in downtown Bangor, and we’ll be back — as in, every Tuesday from now on. They’re serving up very straightforward delicious soft tacos filled with ground beef. (There are other options if you want to get fancy and pay more than $2.) The tacos are just spicy enough to make a beer the perfect beverage to wash them down, and Nocturnem just happens to be the perfect place for tons of local brews. My husband and I are also obsessed with Bissell Brothers’ The Substance, which you can often find on tap. Described by Bissell as a “brightly dank ale,” it’s a hazy, tasty IPA that finishes smooth and goes really well with tacos. “Family-friendly” might not be exactly how I’d describe Nocturnem Draft Haus, but our kiddos were far from out of place on taco night at dinner time. We’ll see you there next Tuesday! Why we love it: When I started taking yoga classes at Om Land Yoga on Center Street in Brewer, I would look out the window, across the street, to Logical Sip. I decided to go in for breakfast one morning and ordered an acai bowl. It’s now my favorite thing to order. Logical Sip’s acai bowls are smooth, tasty and not too sweet. They’re made with blended ice, almond milk, yogurt, blueberries, banana (which I typically don’t like), honey and acai with coconut, granola, honey, chocolate chips, banana and blueberries on top. You can get them in half and full sizes and take out any toppings you don’t want. I get the half-size with half the chocolate chips. It’s perfect for a healthy breakfast or lunch if you don’t feel like having that sandwich with all the bread. I still go to yoga classes across the street and enjoy that immensely, but knowing I will get my now weekly acai bowl afterward makes it even better. Why we love it: Hot apple cider, with its bright flavors and warmth, is a delight on these cold and dreary days. And the Hot Apple Cider at West Market Square Artisan Coffee House is one worth sipping. Dusted with cinnamon and served at a hot but drinkable temperature, I love it. But what really makes it special is that the baristas steam the apple cider to heat it, giving it a wonderful frothiness. It’s delightful.